A good way to check the credibility of a story on a pop news site is to go straight to the original source. This research was published in Nature, which is a very prestigious journal. I'm not an expert on the observational study of AGN, so I can't say how reliable are their methods for estimating the mass of this thing. I can just say that it's an indirect method and so there are probably large uncertainties (compared to say, watching orbital motions and applying mechanics). The Eddington limit is a good check -- basically it is a statement of how luminous something can be before it disrupts itself or its surroundings by its own radiation pressure. For a black hole it places a limit on the accretion rate, and by association the expected mass of the hole. Uncertainties aside, I think the evidence that this quasar is powered by a much more massive black hole than previously known at that distance is very compelling. It'll definitely cause more discussion and research into how it grew so quickly. That's what is so fascinating about this. If it is as massive as they think, how did it grow so fast? Is there possible more to black holes then we know? I mean of course there is we have large gaps in our knowledge of the universe including black holes. What I'm wondering is, with this show us another method in which black holes can grow? Thank you for following up for me. Like i said usually this site brings good data but there have been stories on there that shouldn't be. I have always wondered how the energy escapes the black hole. Is the energy produced outside the event horizon? Or is it produces inside and somehow escapes the gravity? Also was looking up rotating black holes with an ergo sphere after watching interstellar. Very good movie even with the gaping plot hole with the dying plants. So it may be possible to harvest energy from an ergo sphere, i find that interesting as well. Would there actually be time differences if you were to enter the ergo sphere and then leave? Previous research into the growth of 1 billion solar mass black holes by a redshift z=6 suggests that these must have grown with jet-enhanced accretion rates. That basically means that the jets carry away most of the radiation, allowing for a much higher accretion rate than you'd expect from the Eddington limit. Possibly this process might explain the formation of this black hole, too, or it might be that much of its mass collapsed directly from a large gas cloud at the onset of galaxy formation. Probably a mixture of both. But there's a lot we still don't understand about that early era of the universe's history, and there may be surprises in store. I have always wondered how the energy escapes the black hole. Is the energy produced outside the event horizon? Yes, outside the horizon. It can be shown that anything inside the horizon, whether a massive particle or a quanta of radiation, can only move further inward. So it is absolutely true that nothing escapes from within a black hole. So the energy we see "emitted from" a black hole is actually being produced outside of them. Material that the black hole eats doesn't typically fall straight in, but rather forms an accretion disk which spirals around the hole before making the plunge. Friction within this disk heats it up to enormous temperatures, and so it emits a lot of radiation. The jets that stream away from the black hole's poles are also produced outside the horizon, and are directed by the strong magnetic fields wound up by the accretion disk. You may also have heard of Hawking radiation. This radiation also comes from outside (but very close to) the horizon, and is produced by a quantum mechanical process. 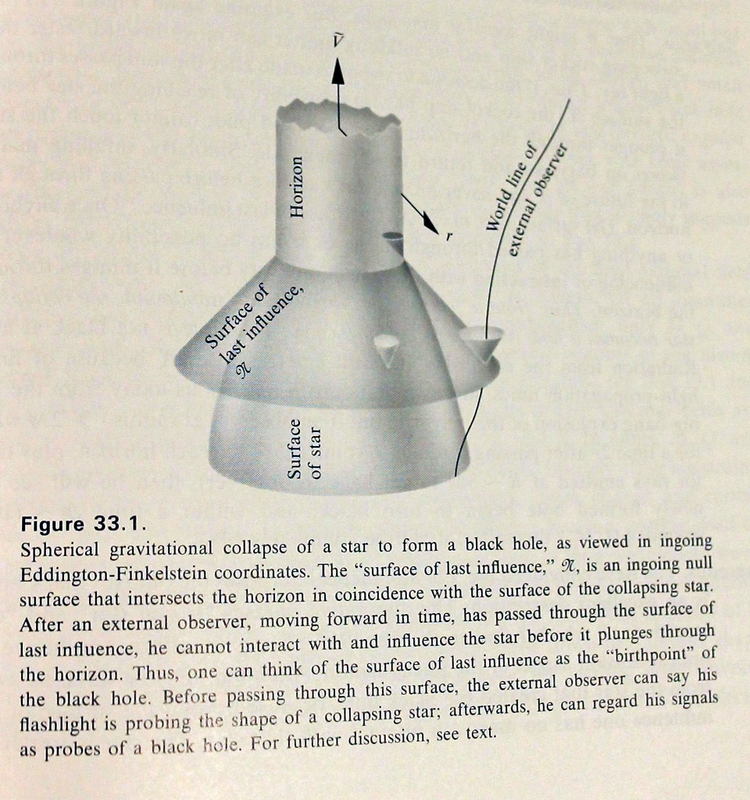 Also was looking up rotating black holes with an ergo sphere after watching interstellar. Very good movie even with the gaping plot hole with the dying plants. Plot hole? Isn't that just blight? The premise is that a type of blight shows up which spreads rapidly across various types of flora, and also "eats" oxygen in a similar manner as nitrogen fixing bacteria (so oxygen levels in Earth's atmosphere steadily drop.) The evolution of such a catastrophic form of blight is enormously improbable, but blight itself is a real thing and has destroyed many species of plants before. So it may be possible to harvest energy from an ergo sphere, i find that interesting as well. Not just may be, but is! This is called the Penrose process after the guy who first studied it. One of the very strange quirks about the ergoregion is that you can have a negative net energy there. The idea then is that you (violently) shove a mass in the direction counter to the hole's rotation. That mass will fall into the hole, while you will escape with a net gain of energy. The excess energy you leave with came from the hole's rotation. Would there actually be time differences if you were to enter the ergo sphere and then leave? Absolutely! You don't need an ergoregion to do this, either. Simply approaching close to and then leaving from a non-rotating black hole will cause a difference in time elapsed for you versus someone who didn't make the trip. This time dilation even occurs here on Earth. Clocks tick more slowly at low altitude than at high altitude (gravitational time dilation), and they also tick more slowly for a clock in motion relative to one at rest (special relativistic time dilation). Both effects are small in everyday life, but near a black hole they are extreme. So, as I understand it, this black hole grew faster than our current understanding would suggest is possible. Is it possible that this was a merger of black holes? Not very likely. It takes time for black holes to find and merge with one another, and you'd still have to explain the formation of the previous generation. You can cut the average size of those earlier holes by making it a merger of a larger number of them, making it easier to explain how they formed so rapidly, but then the statistical likelihood of them all merging together so soon becomes even more questionable. And yeah, this black hole's mass is an outlier compared to the population of black holes we so far know at that distance, but not enormously so. Just a factor of 10. If it were like a factor of 100 or 1000 or more then this would demand a radically new formation mechanism. But a factor of 10 can probably be explained by some combination of processes we already know of, e.g. jet-enhanced accretion after the collapse of an unusually massive parent gas cloud. There is no good theory out there for black holes, scientists have a big part of physics missing. First up they say it is impossible for one to form, yet they are there. Russians call them frozen stars because as soon as one is just about to form it freezes in time from our perspective. So how can a black hole even get bigger since it is impossible for one to form anyway? My theory is there is no such thing as event horizons, time dilation never gets that extreme. So how can a black hole even get bigger since it is impossible for one to form anyway? The field outside a spherical shell of mass is exactly the same as if it was instead a singularity at the center. So even treating a black hole as a shell of material frozen and smeared over the horizon, it looks identical to the classical singularity description. You can prove this with just a little calculus. Or Birkhoff's theorem. Russians call them frozen stars because as soon as one is just about to form it freezes in time from our perspective. Try as you might, you can neither see nor interact with the surface of that "frozen star". The same redshift that makes the star freeze at the gravitational radius also makes it fade to blackness. In a continuum approximation (ignoring the discreteness of photons), the intensity of radiation leaving the star's surface drops exponentially, reducing by a factor of e for every 10-5 seconds per solar mass. Within a fraction of a second, the star is essentially black. Discreteness of photons makes it even blacker. In very short order comes the last photon that will ever emerge from the star. Thereafter it is not only essentially black, but absolutely black. Maybe you try to shine a light on the star's surface to illuminate it. Or maybe you try flying in yourself to scoop up some of the material. Sorry, doesn't work. You can show with a space-time diagram that there is a critical point, beyond which any causal influence between the outside universe and the star's surface is impossible. The light you shine down on the star surface will not be reflected back to you, and if you try to dive down to reach the star yourself, you'll find you cannot reach it. At the horizon you find nothing of importance, and you continue right on down to the singularity where you are killed (actually sooner because of tidal forces). I discussed this all in some detail in the astronomy questions thread by the way, and if you would like a source I'll refer you to chapter 33 of MTW, the intro of which contains an absolutely brilliant Sagredus vs Salvatius type dialog on the description "black hole" vs "frozen star", elements of which I used in this post. Wouldn't the time dilation differential near the Schwarzschild radius cause any force you impose on the "scoop" to be "amplified" in a sense by the tau factor? It would be impossible due to the discreteness of quantum events to interact past a certain point because of that, even if the matter is there. Going by expando's view, it would be more like anything that approaches the event horizon becomes like dark matter in a sense, interacting gravitationally but not releasing any photons or being possible to interact with by any known means. Just a question, I'm not sure if I'm even close. No, nothing of that sort. Physics locally at the event horizon is just the same as physics anywhere else. As you approach and pass through it, you do not notice anything strange (besides the increasingly distorted view of the outside universe and increasing tidal forces). You do not emit less or redder light, you do not seem to slow down, and you do not impose any more or less force on your immediate surroundings. Remember, gravitational time dilation is not a locally observable phenomenon. It is only apparent between two places where gravitational field is different. The reason you can't interact with the material that originally formed the black hole is because it lies in a different region of space-time than you, and you are not causally connected to that region. This is most easily seen with a space-time diagram (see below), showing the surface of last influence as a radially ingoing null surface which meets the horizon just as the star has collapsed within the Schwarzschild radius. Any observer passing through this surface (labelled with a script R) can no longer interact with the star. To do so requires following a space-like trajectory, (going faster than light), which is forbidden. To the observer outside the hole, it seems the collapsed star has frozen at the event horizon (though not visibly so, as described previously). But in the frame of the star, or an observer standing on its surface, the collapse does not stop at the horizon. It continues right on down to singularity in finite time. So if you are watching a star collapse from far away and wait long enough (really not long at all), then it will appear exactly like a black hole, and if you dive in, you will not encounter the star's surface. You will instead encounter a singularity. This apparently contradictory description is simply a result of the gravitational time dilation, and if it's confusing, don't worry. It confused physicists for a long time, too, when they first started studying these objects. It usually takes a bit of effort to grasp it. Well when a gravitational singularity happens in the Maths, in my opinion they have got a theory wrong. Same with Dark Matter/Energy, they thought they had everything figured out but when someone decided to model relativity with the formation of galaxies, everything flew apart, instead they just assumed there must be some other type of matter that makes up 20 times more we can't see and does not interact with normal matter except gravitationally, they just kept adding more and more invisible matter to the model until it resembled what they wanted. Dark matter/energy needs to be discovered, proved and tested and singularities should not be accepted as they are impossible. Your understanding of these topics is exceptionally poor. You should probably study them more carefully before you decide that you are capable of forming arguments about them. You'll recall this has been an issue with some of your prior claims about science on this forum. (E.g. the expanding earth...). If you want to understand the deal with singularities, you may read my post here. If you want to understand dark matter or dark energy, take a course or buy a text on modern cosmology. Or I'll be happy to try to explain it to you myself if you can convince me that you're sincerely interested in learning rather than trolling. So far you've done a pretty bad job of that. You just reply saying that you know more, you even said in your supplied link that a new quantum theory of gravity may dispel the existence singularities (something that is impossible to exist), so I say the current theory is wrong, the calculations and assumptions which lead to the existence of a singularity must be wrong, it is that simple. Even though the universe is currently accelerating, without the existence of dark matter/energy, the universe will eventually pull back into itself. For example imagine the universe only contains the Earth and a spaceship in orbit. The spaceship accelerates and reaches escape velocity, now the spaceship is travelling away but the Earth is still exerting a pull and a much lighter pull the further the distance out. But eventually that pull will be enough to eventually reverse the course of the ship and return it back near Earth in the far distant future. It is incorrectly taught that once an object reaches escape velocity, it will never return. No matter what the energy supplied, if there is a gradient and you roll a ball as fast as you can up that gradient, and the gradient reduces squared the distance out, the ball will still eventually roll back. Did you actually read through my post thoroughly? If so then you did a very bad job of comprehending it. Even though the universe is currently accelerating, without the existence of dark matter/energy, the universe will eventually pull back into itself. Wow, you don't even understand the difference between how dark matter and dark energy affect the evolution of the universe. Without dark energy or dark matter the universe would be open -- meaning have a decreasing expansion rate which never drops to zero. Your argument that it would pull back into itself is wrong. It is incorrectly taught that once an object reaches escape velocity, it will never return. You are wrong again, and this can be shown with calculus. If you keep attempting to argue instead of taking my hint that you just need to spend some time learning these things then I'm just going to give you more time off. I read it, found the assumptions unconvincing, but if you want to assume it is a comprehension problem and ban/threaten to ban people, that's not proper behaviour and I have moderated forums before as well.